Marineland Florida, could be considered the original swim with the dolphins facility, they started primarily to do shows and films dealing with marine life in 1938, and it has easily developed itself into one of the must successful marine animal locations in and around the US. 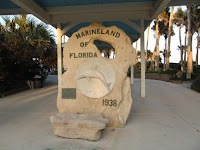 After some time, experiences with the dolphins and interacting with them has become more and more commonplace, Marineland has become one of the main attractions for people all over the world to come and swim and interact with the dolphins. Needless to say, because Marine had the early start in the Marine Animal industry, it has become one leader in the industry. Marineland, the beginning of a promising future for the lives of one of earths most intelligent creatures, the dolphins and having a historical start in the Hollywood industry, it was without a doubt the leading contributor to this Marineland's legacy and publicity that soon pushed it to forefront in the new age of dolphin interactions. Being up close and personal, after all, what person does not wish or dream to swim with the dolphins? After seeing and witnessing this time and time again on television sets and movie screens across the country, this began the boom of Marineland in the past and in the future too.